President Nicolas Maduro at International Workers' Day celebrations in Caracas, May 1. Braving the heat, more than 100,000 Venezuelans flooded the streets of Caracas on May 1 to commemorate the International Workers' Day and gains for working people under the Bolivarian Revolution. 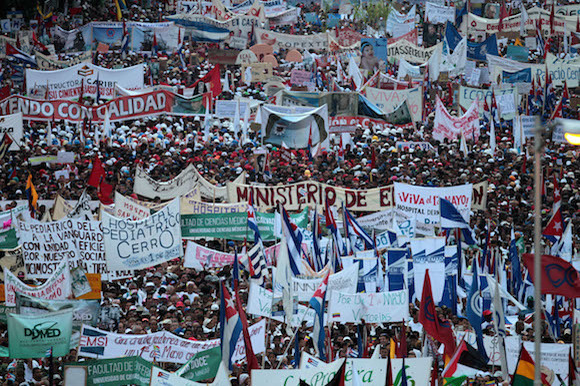 An estimated 1 million people marched on May 1 in Havana, Cuba, to celebrate International Workers´ Day, TeleSUR English said. 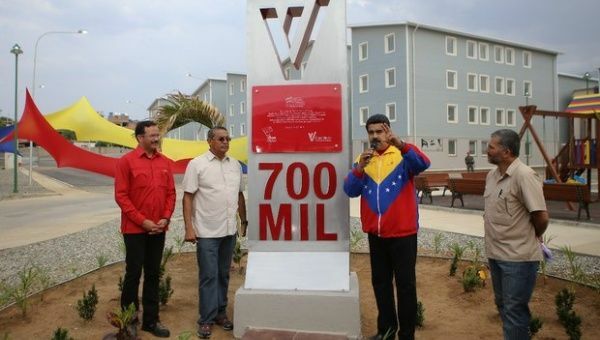 Photo: Venezuelan Presidency Venezuelan President Nicolas Maduro inaugurated the 700,000th house built under a state-led initiative to provide housing to the most needy Venezuelans on April 17. During the celebration of the launch, part of the Great Mission for Venezuelan Housing program, Maduro said the program aimed to build hundreds of thousands of new houses between now and the end of next year. President Nicolas Maduro of Venezuela began his visit to Panama City for the Summit of the Americas with a visit to the impoverished neighbourhood of El Chorrillo to lay a wreath at the monument to those killed by the US bombing of the community during the 1989 US invasion of Panama. The seventh Summit of the Americas, held in Panama City on April 10 and 11, was widely hailed as a victory for left-leaning and progressive forces in the region, particularly Venezuela and Cuba. A group of Australian academics, unionists, politicians, and others have urged the US to “stop interfering in Venezuela’s domestic affairs”. More than 70 prominent Australian progressives issued an open letter to US President Barack Obama condemning US sanctions against Venezuela on April 9. The letter, initiated by the Venezuelan Solidarity Campaign in Melbourne, is printed below. The letter was handed to US consulates in Sydney and Melbourne on April 10. No more coups! No more interventions! Repeal the Executive Order! Venezuelan President Nicolas Maduro, along with his Bolivian counterpart Evo Morales, received a petition with 10 million signatures against U.S. President Barack Obama's executive order labelling the country as a “security treat” on April 9. After the decree was issued, Maduro launched a campaign seeking 10 million signatures from Venezuelans demanding the decree be repealed, saying he would present them to the U.S. President Barack Obama at the April 10-11 Summit of the Americas in Panama. The Venezuelan government-initiated campaign calling for US President Barack Obama to repeal his executive order that arbitrarily declares Venezuela an "extraordinary threat" to US "national security" had more than 6 million signatures as March 31. Venezuelan President Nicolas Maduro announced on his weekly television program that the campaign has collected 6.2 million signatures so far. “I believe that Obama's threat has awoken a great amount of love for what we are going for in our country,” said Maduro. Since US President Barack Obama's administration decided to impose new sanctions on Venezuela on March 9, many people, including journalists, have asked what motivated them to do this. Some are curious over the apparent inconsistency between this move and the White House decision in December to begin normalising relations with Cuba. Others are wondering why the Obama administration would do something that so obviously hurts the United States-backed opposition in Venezuela, at least in the short run. Venezuelan President Nicolas Maduro announced the creation of the Ministry of Ecosocialism and Water, which will be tasked with protecting the environment in the context of Venezuela's bid to build “21st century socialism”. The new body will supervise the National Water Plan, designed to ensure public access to water, as well as the Tree Mission, which involves the community in reforestation efforts.